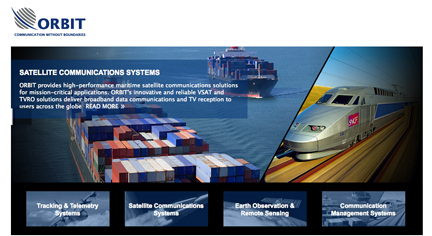 [SatNews] ORBIT Communication Systems will showcase its new line of airborne communication solutions at Farnborough 2014. AirLNK™ end-to-end LOS and B-LOS communication solutions for UAS. Throughout the exhibition, ORBIT will be conducting simulations of its Airborne Communication Solution at Stand C21 Hall 1. These simulations will enable visitors to experience in first hand its latest product releases. ORBIT has been developing and manufacturing airborne communication systems for more than 40 years. Through these core business activities, the company has developed strong expertise in avionic communication management systems and airborne satellite communication systems. Moreover, ORBIT is recognized as a pioneer in the migration to IP/AFDX based avionics and Ka-band based satellite communications. The company takes pride in its ongoing business relationships with more than 30 armed forces, 1st tier aircraft manufacturers, cockpit integrators and satellite communication service providers worldwide. ORBIT's airborne communication solutions are deployed on myriad platforms such as mission aircrafts, airliners, business jets, fighters, UAS's and helicopters. Mr. Ofer Greenberger, ORBIT's CEO, said, "Innovation has always been ORBIT’s main driver and key differentiator. Our exhibit at Farnborough highlights some of the fruits of our constant innovation efforts. In addition to enhancing our offerings for our existing military and civilian customers, we expect ORBIT’s new line of airborne product solutions to open up new business opportunities and expand our market share. We look forward to presenting our latest solutions to a wide variety of manufacturers, integrators and end-users at this prestigious industry event."